Here’s this week’s Friday Five from PreppingToSurvive: choosing a good survival knife, surviving a societal collapse in suburbia, splinting a lower leg fracture, a would-be hero is fired after thwarting a robbery, and a former Senator tries to call attention to the debt problem. Prepping has really taken off in recent years. Once thought primarily to be the realm of deep-wood nut jobs, prepping has become more mainstream in recent years. And businesses have taken notice. 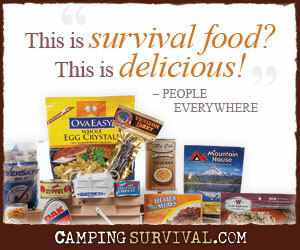 There are all kinds of offerings designed to help a separate a prepper from his hard earned money. From The NY Times. Whether on a weekend camping trip or unexpectedly trying to survive in the wilderness with minimal supplies, a good survival knife is one item that’s worth it’s weight. From harvesting and preparing a meal to splitting firewood, a good knife is valuable. But what should you look for in a good knife? According to Survival Spot, there are 7 things to look for. From Survival Spot. When a gunman walked into an auto parts store, threatening to harm the employees and demanding money, one fast-thinking employee decided to take action. He slipped out the back, retrieved a weapon from his vehicle, and went back in the store to save his manager from harm from the would-be robber. His reward? The employee, a soon to be father, was fired two days later, right before Thanksgiving. From The Blaze. Most people reading this have access to some of the best healthcare system in the world, bar none. That’s not to say it’s not without flaws, but it’s there when you need it. However, getting to adequate medical personnel may be tough. Do you know what to do if you break a leg while on a long hike in the woods? Or maybe after TEOTWAWKI? The Art of Manliness has some good instructions on splinting a lower leg fracture. From The Art of Manliness. To quote the great pontificator Yogi Berra, “It’s déjà vu all over again.” The US is facing not one, but two, fiscal crises of our own making. We got here because Congress couldn’t agree on an economic solution. When it came down to the wire, Congress passed temporary measures to keep things running thing and to give them time to address the bigger problem. They didn’t. And here we are, again. Now a former Senator is trying to call attention to the huge debt problem in a funny and lighthearted way. From FoxNews. Love the five. Keep it coming. Thanks, George & TheSurvivalGuy! That’s good to hear. I appreciate the feedback.